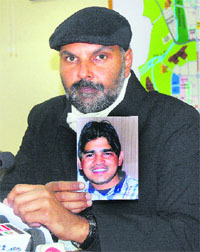 With the police failing in arresting the accused, Rahul, in the siblings’murder case following repeated raids across his possible hideouts in Haryana and Delhi, the UT police today released the photograph of Rahul who allegedly murdered Gaurang and Kavita Sahu at their residence in Sector 41 on December 16. For many, Deepak Sharma, one of the main accused in the murder of high-profile Chandigarh-based cardiologist, Deepak Kaura, was a respectable junior resident (JR) in the Department of Surgery at the PGI, Chandigarh, who would prescribe medicines to patients coming in his contact. The senior officials of UT Administration are mulling over reducing the proposed power tariff hike from 50 per cent to 45 per cent. The first public darbar of the UT Administrator Shivraj Patil received a lukewarm response at the UT Secretariat, Sector 9, today. 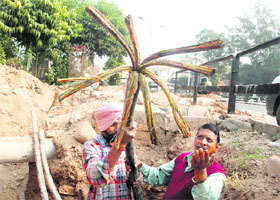 Over 2,000 telephone connections in Mohali went dead last night after thieves stole 15-metre long underground telephone cable, disrupting telephone services at the Deputy Commissioner’s office and industrial/ residential areas from Phase I to Phase VI here. The video conferencing facility to link the Burail Jail with the district court complex in Sector 17 is getting delayed, as the UT Administration has failed to solve the connectivity problem. Shortage of staff in the tehbazari wing and lack of security cover by the police have led to encroachments by shopkeepers in verandas of various markets as the Mohali municipal council has failed to carry out a consistent drive to get these areas vacated. Punjabi singer Harbhajan Singh Mann, who is son-in-law of SAD candidate from Mohali Balwant Singh Ramoowalia, today campaigned for him. While seeking votes for his father-in-law, the singer said he was supporting Ramoowalia due to his clean image and social works being done by him. On a whirlwind tour of villages in the Mohali constituency, the singer attracted a large crowd. The Indian Railway Catering Tourism Corporation’s (IRCTC) go green campaign on e-ticketing received a lukewarm response as only Internet savvy people, especially youngsters, could respond to the campaign. Winter poses an additional risk to those who suffer from heart problems or high blood pressure. Doctors say the risk of having a heart attack during winter might be twice as high as in summer. The Burail Jail authorities today inaugurated a poultry course for jail inmates in collaboration with the Central Poultry Development Organisation (CPDO). It is a six-day course, which will cover rearing, maintenance, marketing, etc, in the field of poultry. As fog has engulfed the entire northern region, flights and trains continue to run behind schedule. The 12011 Shatabdi train from Delhi was late by one hour and 20 minutes against its scheduled arrival at 11.05 am, while the 14095 Himalayan Queen was also delayed by about 50 minutes against its scheduled time of 10.27 pm. Similarly, the 12231 Lucknow-Chandigarh express which was scheduled to arrive at 9.55 am was delayed by one hour and 10 minutes. In recognition of the high standards of professionalism and dedication displayed by doctors, nurses and other staff members towards the well being of soldiers, veterans and their families, the Command Hospital, Chandi Mandir, has been nominated as a centre of excellence in the medical field. Parents of 16-year-old Vineet Sharma, a student of class XII of DAV Public School, Sector 8, have refused to accept that their son died under mysterious circumstances and have raised fingers at hostel warden Ashwini. On the occasion of its founder’s day, St Soldier School organised a three-day akhand path of Sri Guru Granth Sahib. Dr Jaswinderjit Singh, president, Royal Vets Club, was the guest of honour. After being delayed for almost two months following the municipal corporation poll model code of conduct, the city’s first-ever government smart school, built in Sector 53, will be inaugurated on January 13. Students of Government Senior Secondary at Karanpur village in Pinjore block, near here, boycotted classes in support of their demand. Students of Government Senior Secondary, Karanpur village, Pinjore block, stage a protest, in Panchkula. 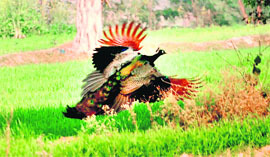 A Tribune photograph. After getting the People’s Party of Punjab (PPP) ticket from Dera Bassi assembly constituency, Bhagwant Singh Baltana has started his campaign. He is a candidate of the Sanjha Morcha and the Communist Party of India (CPI) and Communist Party of India Marxist (CPM) have been supporting Baltana. The District Consumer Disputes Redressal Forum II has slapped a fine of Rs 10,000 to Hyundai Motors India Ltd for not giving discount under the exchange scheme to a Mohali-based resident. The police today arrested a notorious vehicle lifter, Bhim Rattan, along with his three accomplice. Accused Bhim is a resident of Hisar district in Haryana and is facing vehicle theft charges in more than 100 cases of vehicle lifting across the northern region. Chandigarh, January 2 The UT police today arrested a junior assistant with Milkfed in Sector 32 for threatening his wife with a pistol. The accused, Surinder Singh, was arrested on the complaint of his wife, Kulbir Kaur, who is the legal adviser of the Bhakra Beas Management Board (BBMB). The police has claimed to have nabbed a junk dealer, who used to purchase stolen goods. Over 4 kg of stolen copper wire was recovered from the accused, identified as Bhushan Kumar, a resident of Budhalada, Punjab. Known for producing best hockey players for the nation, the Chandigarh based Hockey Academy at Sector 42 again hit the headlines after its former players made it to the different teams of the upcoming World Series Hockey (WSH) tournament. A fine bowling performance by Arjun Aggarwal helped the DP Azad Cricket Academy (Team A) to defeat the LIC Cricket Club, Sector 26, in a match of ongoing Tri-city league cricket tournament held at BTS School Sector 48, here today. Arjun took a five wicket haul after giving away 9 run. Bating first, batsmen of the LIC team failed to face the bowling attack and bundled out on a mere total of 51 runs in 16.4 overs. The Chandigarh Gymnastics Association will host the 25th Sub-Junior National Artistic Gymnastics Championship from January 5 to 9 at Shivalik Public School, Phase VI, Mohali. Punjab State Chess Championship will be held on January 7 and 8 at Mata Gujri College, Fatehgarh Sahib. Prof Bikramjit Singh Sandhu, secretary, of the association, said that 5 players will be selected to represent Punjab for the national level team to be held in Goa from Feb 27 to March 4. He added that all the top players from Punjab will participate in the tournament. The UT sports department will award around Rs 60 lakh under the scholarship scheme. The scheme was announced on July 24, last year.